An Old Master portrait missing for nearly 80 years has been returned to the heirs of Dutch banker and art collector Fritz Gutmann. They now plan to auction the picture with an estimate of $1m-2m. Lucas Cranach the Elder’s Portrait of John Frederick I, Elector of Saxony was last publicly displayed in Rotterdam in 1938. Gutmann’s vast collection in his home to the west of Amsterdam was stolen by the Nazis in 1940, with many works acquired for Hitler and Goering. Gutmann and his wife Louise were arrested in 1943 and died in the camps of Theresienstadt and Auschwitz a year later. But after its former owner acknowledged it had been stolen, Gutmann’s heirs, with the help of experts at Christie’s, negotiated its return. The half-length oil on panel will now be offered at Christie’s Old Masters auction on April 19 in New York. The portrait, painted in the 1530s, depicts John Frederick I (1503-54), an electoral prince and head of the Schmalkaldic League of Germany - a defensive alliance formed by Protestant territories. John Frederick was an ardent supporter of Martin Luther and the Reformation, and is considered to be one of the founders of the University of Wittenberg. He married Sibylle of Cleves in September 1526, whom Cranach also portrayed on numerous occasions. 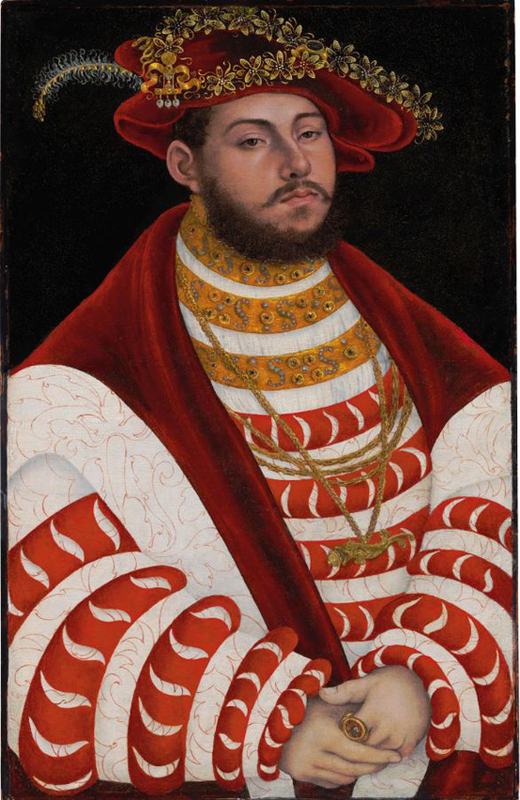 According to Christie’s, this painting is one of Cranach’s most refined depictions of John Frederick, who at the time of painting was the artist’s greatest patron and close friend.